The wind blew hard out of the east for most of the week, keeping the entire fleet at the dock until Friday 10/06. Went out in some sporty conditions on Saturday morning with Keith and his friends from Ft. Lauderdale. Started out in green water, caught a few king fish, the pushed off-shore and finally found the Blue Water in about 900′. 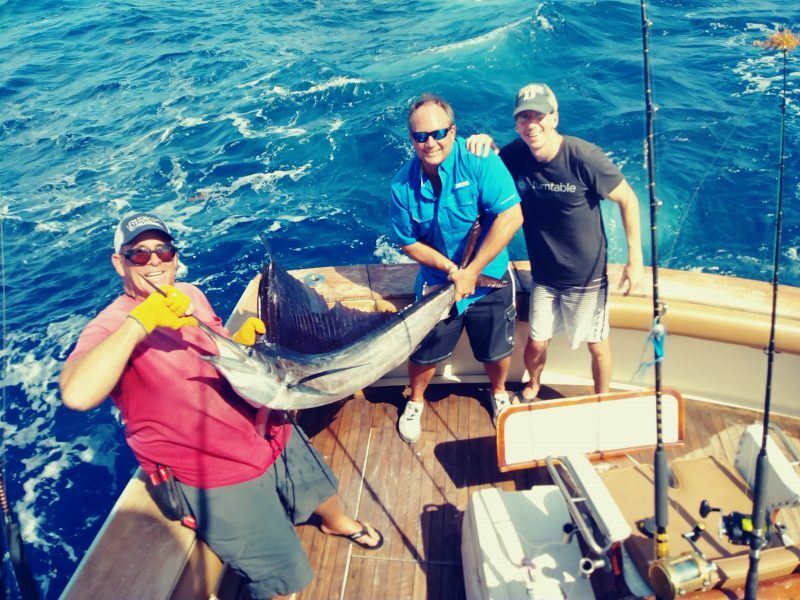 Keith landed a nice Sailfish after about 10 minutes of trolling strips and ballyhoo. Got a few gaffer Mahi’s and then ran to a wreck where the party caught a dozen Vermilion Snappers, and a Snowy Grouper. Our Sunday trip was with Chris and son John from Coral Springs FL. John reeled in a couple of Kings, and a Bonito or two before we headed off-shore and found a great edge in about 700′. 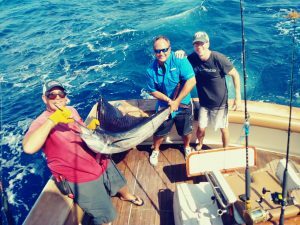 Chris landed his first Sailfish, with the help of son, John. We gave them some extra time on the 4 hour charter and got covered up with Mahi’s .